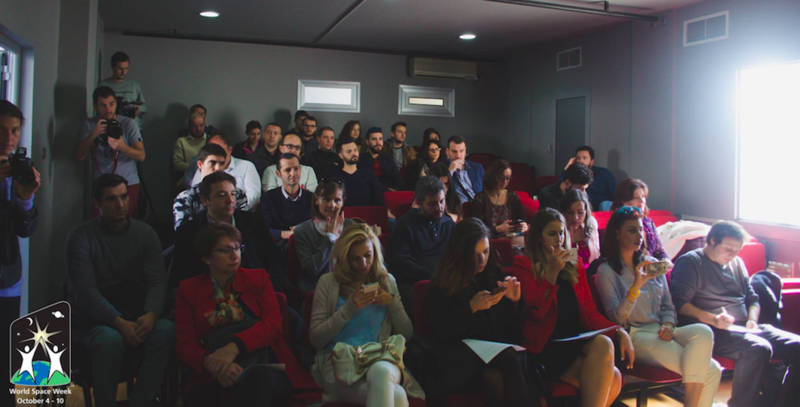 The crowd in attendance at the World Space Week Macedonia event. My home country, the Republic of Macedonia, located in the western Balkans, has 3 cities among the 10 most polluted cities in Europe. Still, community engagement and use of publicly available data have had an enormous impact in disrupting conventional wisdom and promoting environmental sustainability. Since 2011, as part of a joint project between the European Union and Switzerland, 17 air quality monitoring stations have been put throughout Macedonia. Each station houses a maximum of six sensors that measure any one of the following pollutants: PM 10 (particulate matter 10 micrometers or less in diameter), PM 2.5 (particulate matter 2.5 micrometers or less in diameter), CO (carbon monoxide), SO2 (sulfur dioxide), NO2 (nitrogen dioxide) and O3 (ozone). Gorjan presents the MyAir (MojVozduh) application at Booking.com event. 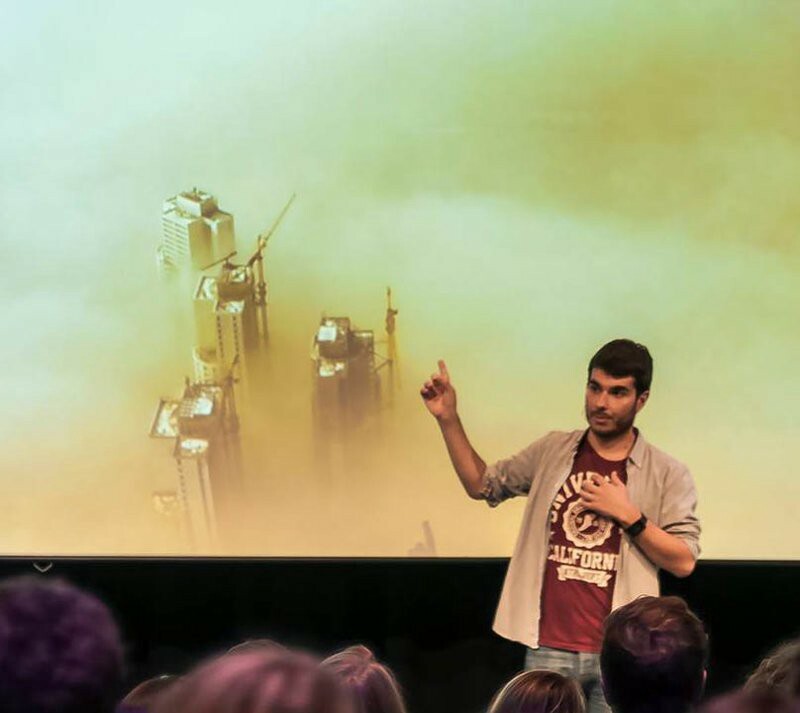 One young developer in Macedonia, Gorjan Jovanovski, decided to use those datasets from the ministry for environment to build MyAir application (MojVozduh) which provided clear visualizations of pollution levels so everyone could understand them. Confronted with the visualized datasets, which show the harmful environmental impact, unwilling attitudes have been fast replaced with real action. Given the critical level of this problem, we are still working on a long-term solution, and because residents have started to understand how bad the situation is, they have been organizing many initiatives over the years to subjugate this issue. 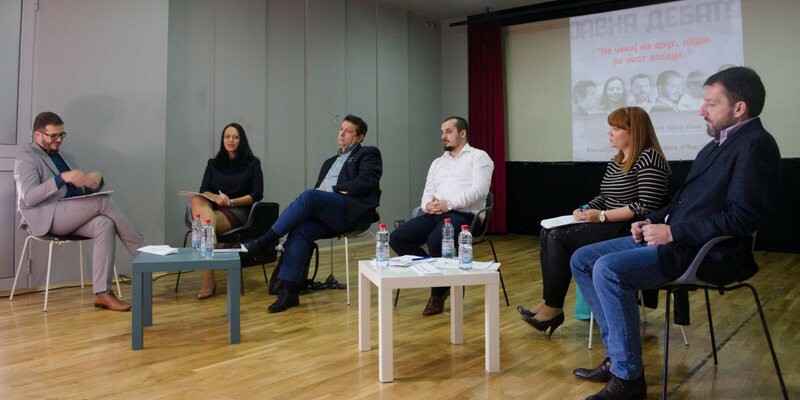 In October 2017, as part of World Space Week Macedonia, I partnered with local activists to organize local discussion of how the tech sector, by using NASA satellites and research data, can contribute and influence creation and adoption of new solutions with more precise information. I presented the idea of #NASADatanauts and our role in the societies we live in. This meant speaking about how, by using open data from NASA from sources like GES DISC, Earth Data, or the official NASA Open Data Web Page, we can build awareness, improve the аccuracy, and create basics for creating real practical projects that can fix this problem. “Having open, global data, with which we are able to measure air pollution from a reliable and unbiased source, is critical when it comes to discussing possible solutions. By the data being accessible to anyone, a multitude of minds from different backgrounds can analyse it, coming up with new and innovative ways of displaying it. This, in the long run, will enable activists like myself to take more steps in locating and shutting down major pollutants in our countries,” said Gorjan Jovanovski, who now plans to use satellite data from the Sentinel-5P satellite, part of the Copernicus earth observation program, to improve his application. 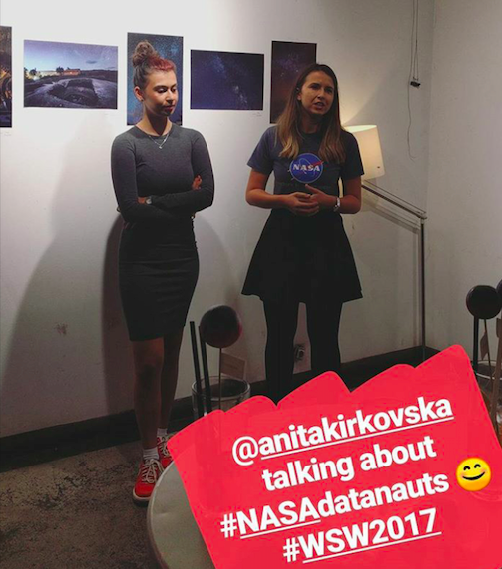 As a NASA Datanaut in the Fall Semester of 2017, I became familiar with the data sets that NASA has and the goals that we can achieve in our own societies by leveraging them. Because I am new to data science, the first activity that I could have done to bring that outcome to my country was a community event. The power of open data is stupendous and can influence innovation and improve our lives in so many ways. This discussion included panelists that were able to display different perspectives of the problem, representing public administration from the environment sector, tech companies, local activist groups, an innovative fund for supporting social entrepreneurship and institutions like the United National Development Program (UNDP) which aim is to build sustainable future. The panelists of the panel on using open data to address air pollution in Macedonia. Jani Makraduli, Deputy Minister of Environment, who pointed out ways the government is collecting and distributing data online for every citizen, as well as taking specific short and long term actions together with the community. Hajan Selmani, Founder of HASELT, a major innovator and tech leader in Macedonia, who talked about how they need more sensors or ways to collect data, such as from satellites, where the tech sector and the public administration can work together. Jasmina Belcovsksa, UNDP representative for capacity building in Macedonia for introducing social innovations, who pointed out specific data collections from UNDP research done in Macedonia over the past year. Jovan Despotovski, Director of the Fund for Innovations and Technology Development, who talked about doing #O2 Hackathon to financially support specific projects that would have the capacity of solving this problem. Eli Pesheva, member of local activist group for the air pollution, who showed global data, and pointed out the need to observe and approach their condition, both individually and on an institutional level. To show the real practical use of data sets, we presented statistics from the #MyAir application (MojVozduh), by sharing how many days the PM10 particle limit set by the EU has been exceeded in Macedonia from January 2015 until September 2017. 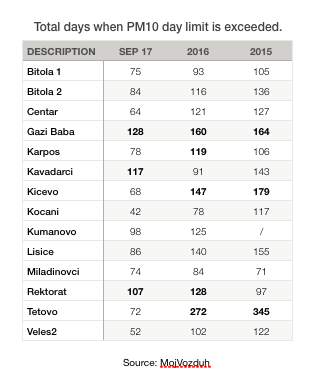 The most polluted city, Tetovo, was over this limit 345 out of 365 days in the year, and without the data they really weren’t aware of problem. In order to fix this issue long term, we have many obstacles to overcome. Initiatives like this help us outline future action points, but by using these insights and implementing real measures against pollution, we can do so much more as individuals, organizations and as a country overall. Enormous thanks to Matt Scott and the whole team at open NASA and the Datanauts program for publishing our story. If you liked what you’ve read don’t forget to share some 👏👏👏 with me today.